Jessyn Farrell is just like you: a Seattle mother with a too long commute and concerns about paid family leave, climate change and education. She’s also a member of the Washington State House of Representatives, which means her day job might make yours easier. Farrell, 42, represents the 46th Legislative District (that’s Seattle, Lake Forest Park and Kenmore, if you don't have your legislative district map handy). She’s got a toddler and two kids under the age of 8. She assumed office in January 2013 and gave birth to her third child during her first term; at the time, there hadn’t been a female House member with a baby in two decades. As such, Farrell not only debates policies that affect families — she lives them. Farrell’s political interests include more than family matters. 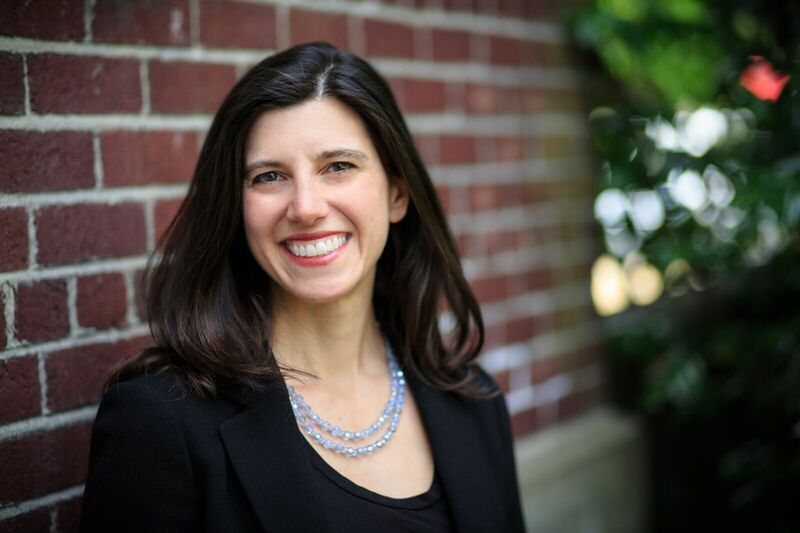 She’s an attorney with a background in mediation and environmental advocacy who served as executive director of Transportation Choices, which works to expand bus, rail, bicycle and pedestrian transportation options in the Puget Sound region. Improving transportation options and thus reducing the impacts of climate change are on her list of priorities for Washington state residents. I spoke with Farrell about these issues and more to learn more about how she makes it work as a parent and a politician running for re-election this fall. Full disclosure: I was voted ‘most likely to be a politician’ in high school so I am just living out my dream! While I had thought I would wait until my children were grown, I had been working on environmental policy and done some lobbying in Olympia and I was struck by the fact that there were many young male legislators and hardly any young women legislators. When [Farrell’s predecessor representing the 46th District] Phyllis Gutierrez Kenney retired, I decided to run because we need more women — and more women with young kids — at the table given that so many of the decisions made in Olympia have a direct impact on kids and families. The day I was sworn into office ... my husband was congratulated several times — not me! Given the choice of a middle-aged man over a woman with two kids in tow, my husband fit more people’s assumption of what a politician looked like than I did. What was the best advice you got when you began your professional political life? 'The internal affects the external.’ Someone said this to me a long time ago. To me this means I need to take care of myself physically and that I need to take the time to practice cultivating a compassionate, brave heart so that when I am in the midst of what is hardest about politics — the combat, high stakes, negativity and constant need to raise money — my actions and words align with what is best in me rather than what is expedient, reactive or fear-driven. Tell me about your time in Olympia. How have you been received? For example, when I was sworn into office I brought my husband and then 2- and 4-year old. On that first day, my husband was congratulated several times — not me! Given the choice of a middle-aged man over a woman with two kids in tow, my husband fit more people’s assumption of what a politician looked like than I did. It became much harder to stay in this career when I had my third child. I was up for re-election in 2014 and Julian was a 3-week old infant when The Seattle Times scheduled their endorsement interview with me. I couldn't say no as the primary was only a couple weeks away and they had a deadline for their endorsements. My mom held the baby outside of the building while I, in that sleepless, parent-of-a-newborn state, struggled to answer cogently questions about my legislative record. How can a career in politics be more accessible to working mothers? To young women? That's a tough one! Olympia is still a good ol' boys’ club. The late nights, unpredictable schedule and assumption that young women are aids not legislators mean that we still have a long way to go to make this career more accessible to working mothers and young women. There are a number of things we could do to make this job more accessible. I’ll list just a few here: First, if we had paid family leave my husband could have taken time off to be at home with our children while I campaigned. But like most families we couldn't afford for him to take unpaid leave so we all did our best and somehow made it through. Second, we need to promote policies and programs in our schools and other community institutions that teach girls that they belong in positions of leadership. Third, strong mentoring networks matter. I’ve had great mentors in my life who have provided guidance [and] opened doors. I’d offer that [type of mentoring] to anyone who might be reading this now and contemplating running for office! What is your take on Washington state's education funding issue? As a parent with kids in public schools, I am extremely frustrated with the lack of progress on school funding. We have a unique state constitution that uses such strong language — 'paramount duty,' 'ample funding,’ ‘all children’ — to describe our obligation to our public schools. And yet, progress is agonizingly slow. There are two core issues for me as a legislator: First, we will have to raise revenue in the coming session to fully fund education and to preserve existing social services and environmental programs, which were cut back significantly during the recession. What are two to three issues, national or local, that working families in Puget Sound should be paying attention to this year? The major issues of our time include combatting climate change, undoing institutional racism and rebuilding the middle class. To paraphrase a sage, we cannot fix these things on our own but we can’t lay the task aside either. With rising childcare costs, many working families are in a serious bind. What policies are you pushing to help families thrive economically and personally? One of my core reasons for being in the legislature is to rebuild the middle class. Policies that benefit women and their families are a key part of that goal. As an example, women make up a majority of minimum wage workers so when the minimum wage doesn’t even pay for the essentials, it disproportionately hurts women and their families. As another example, across all professions, women make less than men for the same work. This hurts women and their families. I have championed legislation to increase the minimum wage statewide and strongly support Rep. Tana Senn’s Equal Pay Opportunity Act, paid family leave and subsidized, high-quality childcare. This year I introduced the Pregnancy Accommodation Act, which would require employers with eight or more employees to provide reasonable accommodations for pregnant women in the workplace. This could include more frequent water breaks, a stool to sit on or scheduling flexibility to get to prenatal appointments. Employers would not be required to provide accommodations if such accommodations would cause undue hardship. Unfortunately, the bill did not pass [in the 2015-16 legislative session] but I will continue working on this issue next year to ensure that no woman faces the impossible choice of keeping her job and having a safe, healthy pregnancy. This year, we're going beyond tired-out debates about having it all to explore the issues you face, from on-ramping and off-ramping to the search for easy meals and family-friendly benefits. Read more in the series. How do you manage living in Seattle and working in Olympia? How's the commute? I commute almost every day so that I can get my kids off to school and see them for a short while in the evening. The commute — 90 minutes each way — is definitely the worst part of the job but I want to see my kids every day and after a fast-paced, high-stakes day, it’s grounding to come home. What are you most proud of so far in your political career? We passed a transportation investment package in 2015. It had a number of things that I helped make happen including funding for the Northgate pedestrian bridge, incentives to improve transit connectivity, authorization for Sound Transit so that it can put light rail initiative on the ballot this fall and requirements to build more affordable housing near transit stations. There was a really lousy compromise in the package that would have siphoned off $500 million from the Central Puget Sound region to fill a hole in the state General Fund. I forced an amendment in the middle of the night to keep that $500 million in our community and to ensure that it would be spent on educational supports for low-income and at-risk children. What rituals do you use to stay connected to your kids and husband during the busiest times of year for the legislature? We eat breakfast together before I leave almost every day and we schedule very little on the weekends so that we can hang out together as a family. I often spend that 90 minutes on the road talking to my husband (using my hands-free device of course!) to catch up and process the day. I have been a legislator now for four years and every year has looked different given the evolving needs of my kids. For example, when Julian was a baby during the 2015 session I brought him with me a few days a week. He was quite good at sleeping in the car on the way down and on the way back. However, childcare was definitely a challenge as my hours were so unpredictable. I initially had him in a daycare in Olympia but I could never guarantee that I could be there by their closing time! I ended up having someone look after him who lived in Olympia and had a 2-year old herself, and by having my mom and dad look after him a couple of days a week in Seattle. When I’m not in session my schedule is quite busy but also very flexible and for that I am thankful. In the interim between sessions, I spend time meeting with constituents, developing bills, campaigning, working as an attorney and hanging out with my family. I relentlessly prioritize ... This means saying no a lot and regularly evaluating what is on my plate to make sure what I am doing is the best way to achieve my goals. You have three kids and a busy, high-profile career. What are a couple of shortcuts or solutions that your family uses to keep it all together? Meal planning! Every Sunday I sit down and plan dinners for the week and do the shopping that day. I'm very routinized about our meals. Each week we do a frozen pizza night, a night featuring beans (like burritos), a pasta night using some frozen pesto or tomato sauce that I made and ferreted away in the fall in anticipation of session and then a couple of other regular rotations. We put the menu on the refrigerator. At least dinner is one thing that takes very little energy and creativity during the week. Have you reached a point where you realized you had to do things differently as a working parent? I relentlessly prioritize to maintain strategic focus. This means saying no a lot and regularly evaluating what is on my plate to make sure what I am doing is the best way to achieve my policy and personal goals. I also rely much more on friends and family these days and try really hard to pitch in when I’m not in legislative session to help other friends and family members out. What are a couple of your family’s favorite spots in Seattle? I am a huge fan of the new light rail stations at Husky Stadium and Capitol Hill. They have opened up the city to my kids in a way that driving around in a car just can’t. My kids spend a lot more time walking, looking at buildings, people-watching and asking questions about their surroundings. Our relationship to distance, people and the built environment becomes different when we are on transit. What’s your ‘just for me' pleasure? Shopping for books in a brick-and-mortar bookstore and splurging by buying five at a time. Are you ever able to ‘turn off’ thinking about your role as a politician? I try to! Staying away from my phone is a good place to start!